He said the new hiring has been spurred by a series of “tremendous product innovations” that have clicked with consumers, such as products aimed at children and toddlers, seasonal offerings such as Choboni Oats Ancient Grain Blend and a soon to be released product to be dubbed Chobani Green Tea Limited Batch. As for upcoming marketing efforts, he acknowledged that Chobani will not run a television commercial during the Feb. 1 broadcast of the 2015 Super Bowl. The company had purchased its first and only Super Bowl ad for the 2013 broadcast. 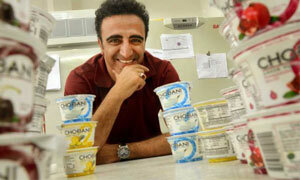 Gonda also denied a report in the New York Post this week that Chobani founder and chief executive officer Hamdi Ulukaya was being pushed out of his leadership role at the business. While a search has been ongoing for a new company chief executive officer, Ulukaya, a Turkish immigrant who started the company in 2005, will remain as chairman and has approval authority over the next CEO, Gonda said.